Curly has been wanting to learn Spanish so we were excited to review a product that teaches Spanish through chants and song that the whole family could enjoy! Classical Academic Press is a publishing company which produces educational materials to complement a classical education. The company produces Latin, logic, Spanish, Greek, and Bible curricula for a variety of ages from Kindergarten through high school. 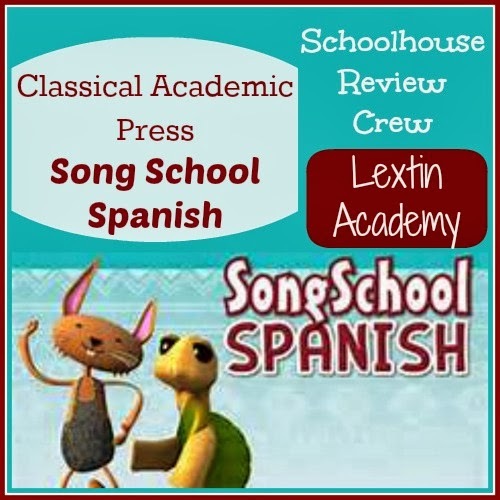 We were blessed to receive a copy of Song School Spanish to review. This program is intended for students in Kindergarten through 3rd grade as an introduction to Spanish vocabulary in a fun and engaging format using songs and a simple workbook. We received a copy of the Song School Spanish Workbook and CD which retails for $24.95. We also received a copy of the Teacher’s Manual which retails for $24.95. The curriculum contains 30 lessons of Spanish vocabulary with some very basic grammar. The CD contains 42 songs in a mixture of Spanish and English. The songs are set to familiar tunes and correspond to the vocabulary in the weekly lessons. The Teacher’s Manual contains answers to workbook questions as well as additional teaching ideas and resources. Classical Academic Press also has an online component at Headventure Land which has online games, readers, and flash cards for some of the programs. For Song School Spanish, Headventure Land offers a flash card game to practice vocabulary as well as coloring pages which correspond to the vocabulary words. I purchased the additional Spanish Amigo Match flash cards at $26.95 to use for review as well. We recently moved to a new city and there are many native Spanish speakers here. My kids are hearing Spanish all around them and they’ve determined they want to learn to speak Spanish. I don’t speak Spanish and neither does my husband, so we’re going to all need to learn together! We were so excited to have the chance to review a Spanish curriculum that is geared for younger elementary students. I used this program mainly with Curly, with Tiger and Bee both tagging along. Curly and I completed one lesson per week. Day 1 – We learned the songs. Day 2 – We practiced the songs and completed one section of the workbook. Day 3 – We completed another section in the workbook and used our flashcards for matching practice. Day 4 – More song review and finishing up our workbook pages. Day 5 – We reviewed songs and vocabulary from previous weeks and practiced with the flash cards. During our singing time, I had printed coloring pages which illustrated the vocabulary words for the kids to color. (These were printed from Headventure Land). They all colored as they sang along-even Tiger and Bee. Tiger and Bee were easily able to learn to the songs and learned Spanish vocabulary through singing. They also did pretend role play with Curly and practiced having conversations. However, only Curly completed the workbook pages as Tiger and Bee aren’t writing well yet. The first few weeks, the student learns vocabulary words and phrases such as: hello, goodbye, student, teacher, What’s your name?, my name is…., How are you?, fine, happy, and sad. The teacher’s manual has answers and some teaching tips. I have to admit that I didn’t need it/use it very often. I was able to do our lessons using the student workbook and song CD. We also listened to our CD in the car. Perfect time when I have a captive audience! Even Ladybug enjoys listening to the Spanish CD. I feel the song quality on the CD could be better. At times, the lyrics were a little difficult for us to understand. Some of the songs are really fast so it was difficult for my little ones to keep up with the words. I was thankful that the lyrics were printed in the student workbook so I could read them along with the song and help teach them the words. There are not many activities on Headventure Land for Song School Spanish. I’m hopeful the company will include more activities, readers, and games to compliment this curriculum. My kids loved singing the songs with the CD! I put the songs on their iPods and I could often hear the Spanish songs singing away while the kids played in their rooms. The songs greatly helped them remember the vocabulary words. The workbook contains just enough work for a young student without being overwhelming. There was not too much writing and there was good review of the words. The workbook introduces things like the accent marks and has the student copying Spanish phrases to note differences in structure and spelling. Curly was fascinated that question marks go at the beginning (upside question marks) and at the end of each question. The program also teaches the Spanish alphabet (we’re still working to master that one) and the pronunciation of the vowels. This has helped Curly be able to sound out some Spanish words we’ve encountered. My kids enjoyed Tortuga and Conejo (Tortoise and Hare), the characters in the book. The book had paper puppets for Tortuga and Conejo and my kids loved using those in role play to practice conversations. I think this book is an excellent foundation for learning Spanish. It teaches common vocabulary words with song and simple activities. It is easy for kids to retain the information because of the review through songs. The program also encourages using the words in context through conversations and role play. But best of all, the program was fun! It is a wonderful, non-intimidating way to introduce children to a new language and star them on a journey to one day mastering that language with a solid foundation in vocabulary words. We love working through the program and will be so sad when we’re done. I’m hoping that there’s a Song School Spanish 2 coming soon! See what the other Crew Members thought about Song School Spanish on the Crew Blog! We enjoyed SSSpanish too. Stopping by from the crew! It has been fun to use here! So fun to try products that are a good fit for your family!